Naples, Florida has a reputation as a playground for the wealthy. Twenty, thirty and forty-thousand square foot homes line the beautiful Gulf Coast beaches. Tour guides gladly point out the gated communities where Elton John, Barbra Streisand and Steven Spielberg reportedly have homes. What people may not know is that this Gulf Coast paradise has excellent accommodations and attractions for every vacation budget. Here are our picks for Naples On A Budget! Tamiami Trail (pronounced tammee-amee) is the main road running parallel to the Gulf of Mexico coastline. It connects many of Naples tourist attractions and accommodations and it is a great place to start your Naples adventure. The Gulfcoast Inn is a great find for those on a budget. Located about halfway between North Naples and Old Naples, it offers an excellent starting point for your vacation day trips. We asked J.J. Dinunzio, Office Manager of The Gulfcoast Inn, what makes it unique. He said, "The Gulfcoast Inn is the classic Florida place to have fun and relax. Close to everything. Our guests have always commented on the friendly and helpful team members, as well as the great pool area." The Gulfcoast Inn has a large, heated swimming pool in a very tropically decorated courtyard. Harold’s Place poolside tiki bar offers both drinks and food. Judging from the number of people enjoying lunch and cocktails there during our visit, it seemed to be a very popular place. This package is just $199 + tax. Dinner can not be used on New Years Eve, Valentines Day or Easter. We enjoyed this package. Our poolside room was comfortable, clean and well equipped. For our dinner, we chose Fujiyama Steakhouse on the hotel grounds. The dinner was one of the best we have had anywhere in Naples and the tableside chefs were entertaining for diners of all ages. There is a good reason Fujiyama Steakhouse has won awards for best Asian cuisine in Naples! • Jungle Larry and Safari Jane’s Snakes Alive! We especially enjoyed the Primate Expedition Cruise where we boarded a boat and a guide cruised us alongside islands inhabited by monkeys, lemurs, and apes. Admission is $19.95 for adults. $12.95 for ages 3 to 12. Children under 3 are admitted for free. The Naples Trolley runs seven days a week from 9:30 a.m. until 5:30 p.m. It is ahop-on, hop-off tour that allows guests to explore Naples sights and then reboard at their convenience for more adventures. The trolley drivers are knowledgeable of Naples’ history, attractions, celebrities and folklore. Our driver was not only knowledgeable, he was actually funny. We enjoyed our tour and we were able to spot the places we wanted to return to later. If you like shopping and riverside dining, you’ll love the unique Riverwalk Tin City. Located on the Gordon River in Old Naples, Tin City opened in the 1940s as a working dock and factory. In the 1970s, it was transformed into a quaint shopping and dining facility with rustic seaside décor. Located in the heart of Old Naples, Fifth Avenue South is the area’s famous upscale dining and shopping center. It’s a great place for an after-sunset stroll past fashionable shops, art galleries and European bistros. Guests of the Naples Princess Dinner Cruise experience “spectacular homes, breathtaking sites and natural beauty of Naples Bay and Port Royal.” The cost is $55.95 for Adults and $27.95 for Children - Ages 3 to 11. During our cruise, Tony Avalon offered his show The Sounds of Sinatra while guests enjoyed drinks from two bars and food at the ship’s buffet. At sunset, may guests took their cameras to the open decks for a chance to photograph the perfect sunset. About thirty minutes south of Naples is the gorgeous gem called Marco Island. It has some of the most beautiful beaches Florida has to offer. It also has The Dolphin Explorer Cruise which may be one of the most enjoyable and educational things we experienced in southwest Florida. Chris and his assistants take guests through the Gulf of Mexico and backwater estuaries to observe marine life in an “up close and personal experience.” Guests are shown photos of local dolphins which can be identified by their unique dorsal fins. The boat was filled with squeals of children’s laughter and excitement as guests of all ages sighted various identified dolphins. Several times, dolphins followed our boat and jumped high out of the water displaying an acrobatic show that everyone enjoyed and photographed. 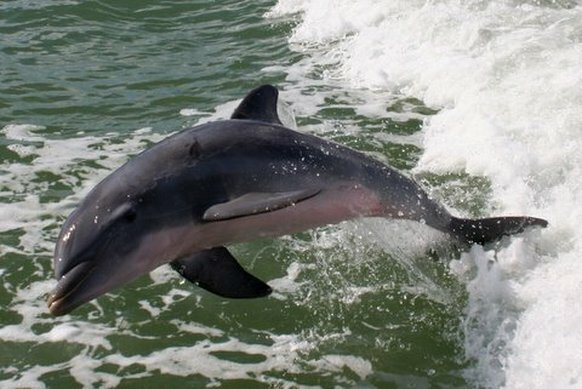 We highly recommend The Dolphin Explorer Cruise! Naples, Florida is an upscale community with a history as a playground for the wealthy but it is also a great place to vacation for travelers on any budget. Watch our video about Naples On A Budget below.